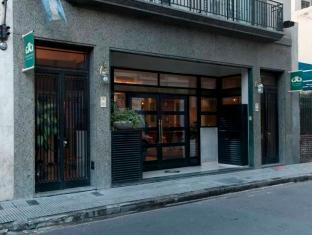 ﻿ Reino Del Plata Hotel Boutique, Buenos Aires - SAVE ON AGODA! Located in the heart of Buenos Aires, the Reino Del Plata Hotel Boutique invites you to enjoy great city views while sunbathing and enjoying the whirlpool on its terrace. The guestrooms offered by this hotel offer plasma cable TV, free Wi-Fi and other amenities including safety boxes to store notebooks. As a guest of Reino Del Plata, your days will start with an abundant breakfast. A bar is available on site. A wide variety of shops and typical cafes await you on the famous Florida Street, which is only 30 meters from the hotel. Many other tourist attractions are also a short walk away, such as the Obelisk, Colón Theater, the Government House and the Museum of Fine Arts. Pros Good location if you want to go around and see the city, staff spoke English, breakfast was decent, room was comfortable Cons it didnt seem safe to walk around at night (though this is true in a good number of cases around the city) AC didn't work even after alerting staff (they did try to help). It was a good thing that the weather was ok (not too warm nor cold). Staff is very helpful, several speak excellent English, interesting and convenient location. Staff was superb, rooms were surprisingly nice, tho hotel is unprepossessing from the outside. Clean, quiet, neat, safe. Many places of interest in walking distance including Cafe Tortoni tango bar, subways, shopping, San Telmo market, monuments. Internel is free and fast. Inexpensive for Buenos Aires. 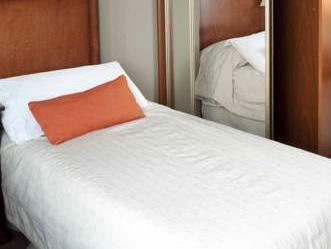 Good alternative to more expensive Palermo and Ricolleta hotels with similar features. Reino dal Plata is an average price and average level hotel. Its location is very central, close to Plaza de Mayo, the obelisc and avenida Florida, the shop centre road in BUenos Aires. The bulding is well mantained but I wouldn't define it a boutique hotel, its design is old and with no particular texture. Room are clean and have fridge, safe. As many hotel in Argentina doesn't provide plugs to recharge your devices except if you move some furnitures. Breakfast is sad and the person in charge of breakfast room service was always out of the room and when in always arguing with someone at the phone, absolutely not a professional behaviour. Staff at reception, on opposite, kind. Price is moderate as the hotel is. It provides a desk web connectio for free and a wifi but at the reception it was working in the room too too slow to be used. The hotel is located in a very convenient place which is very convenient to go visit to those famous site seeing spots. Besides, the hotel staff is very patient and willing to give you advice. You can also book tango shows from them. The room is in ok level but as it is a medium scale city hotel don't expect too much though. Also general window with special sound proof that's a negative point for some people. The hotel is nice to stay for tour. it is very well located, and the reception people are very friendly. So I enjoyed my staying. This hotel is really great value for money. We traveled around South America for 5 weeks and can comfortably say that this place was the best for the price. Good location, good rooms, good bathrooms, good breakfast, really friendly staff. Everything was excellent and I would defiantly stay here again. E had a good time...great service from the staff,very helpful and attentive to all details .went all the way to describe the hotels and surrounding area with passion!The hotel is accessible to the florida street and to San telmo on the weekends.So,those coming tourists will truly enjoy a wonderful time here. Our room was clean,artistically decorated to make it feel homely and the morning buffet is standard continental breakfast.asians may take sometime to acquire the different but unique taste.there are plenty of info at the reception area even for those who want to travel the city or elsewhere in Argentina.A very memorable trip for us. Impressed with the Location and more importantly the standard of the Hotel. Nice room, breakfast were very nice. Would not hestitate to use this property again. i did not have any major problem. the front deck staff was very kind. however, breakfast people could have been more flexible. too strict with the time. the hotel is located closed to the end of florida street which is a walking street.so it is convenient to many touristic places which is a walking distance such as the pink house, the obelisk. my congress was held at the sheraton hotel and convention center which is about 15 minutes walk from the hotel.breakfast is good and enough.there are free wireless in your room and 2 computers are available at the front of breakfast room which you can also access to internet.although there is a tv in the room but very few channels are in english. only 2-3 of movies channel are in english.it should be better if there are news cahnnel in english either bbc ,cnn, aljazeira,fox,rt,etc.service is fairly good.they can help you contact the sight seeing tour to pick you up. the hotel stays in the downtown area just two blocks from casa rosada. i just took a taxi once to come back from a dinner in puerto madero, since was too late (2:00 am). the location of the hotel is very good, about 300 meters from plaze de mayo and florida street. there are subte (subway train) stations to every line in a 200 meters area. rooms are very good, excelents big bed and bathroom. breakfast of very good quality and quantity. staff very nice and helpful. This was our third (and briefest) spell in BA during a short holiday, so we were reasonably familiar with the area. check- in was quick with no info or help offered to us at all. rooms were fine, except we were on the first floor and i think heard everyone in the hotel having showers -must have been a pipe in the walls near our room. but my family in the other room heard nothing. our room was pretty small but fine whereas the other family members had a bit bigger room. there was an easy to use safe and reasonable size bathrooms. the rooms were very clean. the next day we met a staff member who was more than helpful working out where we needed to go and how to get there-so that made up for the staff that checked us in the day before. breakfast was ok, your basic ham/cheese/toast/cookies/cakes and a couple of hot items. felt for the price in the big city, it was great value for money - booking early sure helps!...would i stay here again, - yes to save money. 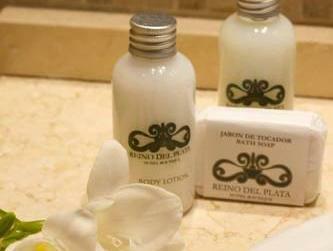 We stay 5 nights in Reino Del Plata Hotel Boutique . the reino del plata was great for staying in buenos aires because it is right by the plaza de mayo and florida ave... the service and staff were very friendly and the rooms were really nice. The hotel has an excellent location near Florida street. The staff was very helpful and friendly service, included was free and speedy internet and free breakfast. small rooms, slow elevator. and since it is next to Argentina's version of the white house they protest a lot. The service was great at this hotel and great for the location and price. After reading reviews on other hotels in Argentina I was afraid that the staff would be non friendly, but this was not a problem. Your room comes with a safe so you don't have to worry about your passport getting stolen on your stay, I recomend never carying with while out in town. Great location right next to florida street so you can get all of your shopping needs done with a short walk. Service was great we were on a first name basis by the end of our trip. Remember this is a small hotel so some acomendations are not able to be provided such as a pool, but they do have a jacuzzi- side note the jacuzzi closes early which I guess is a small complaint if you enjoy staying in a jacuzzi under the stars. Overall however I would stay there again.